Nozzle Height: Easily adjust the height of the nozzle without stopping the equipment. Angled Bag: Features a sewn-in plastic bottom and allows for easy maneuverability of the equipment. Ergonomic Handles: Made with foam grips and an ergonomic design to help reduce fatigue of the operator. 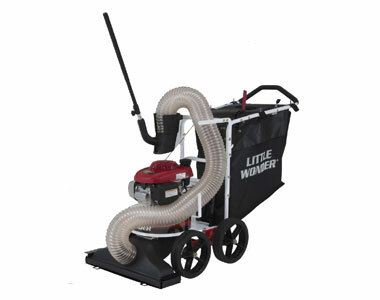 Ask us about the Little Wonder Pro Vac SI 5.1 HP (Honda) Push Lawn Vacuum. Please no repair questions. Your Q&A may be posted to MowersAtJacks.com to help other shoppers, like you, with their purchasing decisions. Thank you. Add options now for your Little Wonder Pro Vac SI at a 1 time discounted price. When you are ready to check out, just click the ADD TO CART button. Description: Intake Hose Kit - 5 inch diameter with adjustable handle.